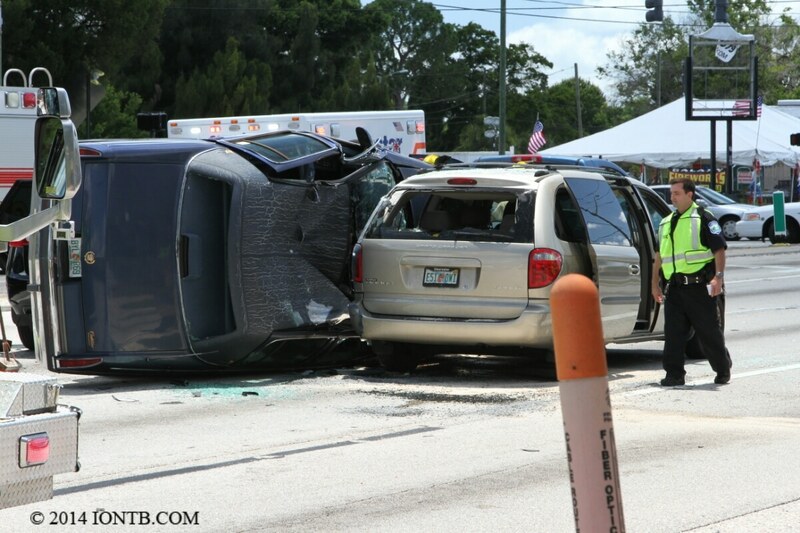 At approximately 2:30pm on Saturday, June 21, 2014, multiple crews from Pinellas Park Fire Department, Seminole Fire Rescue, Sunstart and Pinellas Park Police were dispatched to reports of a traffic crash involving multiple vehicles and a vehicle on its side. Pinellas Park Police now reports that it involved 7 vehicles and 18 people with 6 persons being transported to local hospitals. The investigation is ongoing but here are the details that have been released so far. Katherine Langston, 30 of Dade City was driving a 1996 Cadillac Fleetwood westbound on Park Blvd in the median lane. She stated as she approached Belcher, she noticed that the light was red and began to attempt to brake however she stated the brakes were inoperable. The Cadillac sideswiped a 2005 Ford Escape which was being driven by Mary J. Phero , 53 of Seminole in the center lane, she was not injured. As a result of being struck by the Cadillac, the Jeep hit a 2011 Volkswagen Tourage, driven by Ann C. Garcia, 50 of St Petersburg. Garcia was in the southbound turn lane for Belcher Rd. when she was struck. Ann and her two children, 18 & 14 year old females , were not injured. After the Cadillac struck the Jeep, it struck a 2013 Nissan Rogue which was being driven by Riley Wallace 29 of Seminole which was in the median lane. Riley’s mother, Catherine Theriault 56 of Seminole, was a passenger in the vehicle along with Riley’s daughter, 5 months old. The baby was not transported by ambulance rather she was transported to All Children’s Hospital by family members. Due to the Nissan being struck by the Cadillac it then struck a 2002 Dodge Ram 1500 which was being driven by Minh Vo, 48 of Largo which was in the median lane. Vo was transported to Northside Hospital. After the Cadillac struck the Nissan, it rolled onto the passenger side where it made contact with a 2003 Dodge Grand Caravan which was being driven by Cassandra Ventura-Riddick , 40 of St Petersburg who was in the center lane. Cassandra, her husband, Lance Riddick 41, and her two children, 8 & 10 year old boys were not injured. According to Pinellas Park Police Department, the patients of the crash that were transported to local hospitals by Sunstar have since been discharged. IONTB was also able to determine the occupants of the Nissan Rogue who self transported to the hospital were discharged as well. This cause of the crash is still under investigation.